The ZTE Axon 7 was last year's affordable Android surprise that we liked, and for 2017, it's adding a new tricks to the reasonably priced package. Android 7.0 Nougat can be downloaded to the ZTE Axon 7 starting today, and it brings changes to the phone's interface and battery efficiency. You can now run two apps side-by-side in split-screen mode and access a new set emojis, all while using less battery life than before, according to ZTE. The best part about this overdue Android update is that all ZTE Axon 7 phones are unlocked. There's no need to wait for your carrier to start using it. 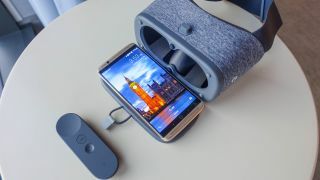 Today's Android 7.0 Nougat upgrade also means that the Axon 7 now supports the Google Daydream View headset for VR games, movies and experiences. ZTE is making good on its promise of having 'the first Daydream-ready phone' – which is technically still true. Yes, the Google Pixel, Pixel XL, Moto Z and Moto Z Force got Daydream first, but ZTE launched the Axon 7 before any of these phones, so it retains that title. Daydream View is inexpensive at $79 (about £69, AU$119), and there's a limited time deal for it in the US. It's just $50 until February 25, the start of MWC 2017. So the discounted VR headset and affordable Axon 7 make a good pairing if you want to dive into virtual reality without paying Oculus Rift and HTC Vive prices. Even better, everyone in the US gets a third perk: caller ID and phone SPAM protection services integrated right into the phone's main interface. It's actually the first device in the US to offer SPAM and scam protection natively for free – without pestering you to pay up after a free trial like on the Samsung Galaxy S7 and S7 Edge.